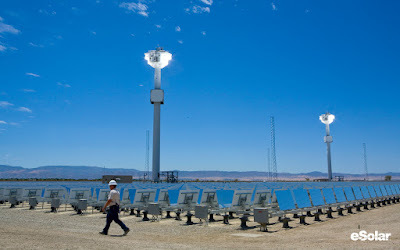 A tale of two Concentrating Solar Power (CSP) Towers generating no electricity? A funny thing happened on the way to Victorville for the Victor Valley College Solar Power Plant Celebration. I decided to stop in Lancaster, California, to benchmark the eSolar, Inc. CSP project I highlighted earlier this year. As can be seen in my photos over two days, one of the Sierra SunTowers is missing the thermal receiver enclosure nacelle, ample or not, and is out of operation. The second tower has an anemic amount of sunlight focused onto the thermal receiver by the heliostat field although it was late in the day. When I was taking site photos from the public road next to the solar thermal power plant, a pickup truck left the main gate and stopped to talk. At first I thought my photo taking was going to be discouraged, but it appears to be a common occurrence. Short into our conversation, the driver said: “You should come back when it is lit up.” Prompted by the unseen passenger, the driver added something to the effect the plant had been “lit up” many times before. For example, please see the eSolar press photo below from the 5 MegaWatt (MW) solar plant commissioning in August 2009. I was flabbergasted at the revelation. Unfamiliar with the technology, my initial suspicions were confirmed. eSolar has said the “Sierra SunTower is the only power tower facility currently operating in North America.” Well, it was not operating on the two consecutive days I visited the site last week. My impression via intuition was the site had been offline for an extended period. My “In Search of” eSolar result was all the more surprising given “eSolar’s Sierra SunTower Named Renewable Project of the Year” by Power Engineering and later received the same honor in the 2009 Excellence in Renewable Energy Awards from RenewableEnergyWorld.com, both PennWell publications. eSolar Founder and Chairman Bill Gross (@bill_gross) likes to tout leveraging “Moore’s law rather than more steel.” I guess Mr. Gross’ misapplication of Moore’s Law does not extend to thermal receivers, pumps, motors, condensers, and turbines? 2010 has been a great year for eSolar beginning with the announcement of a 2 GW (GigaWatt) licensing deal with Penglai Electric in China and the recent award of $10.8 million from the US Department of Energy for CSP baseload system research and deployment testing. However, earlier in May 2010, “PG&E, NRG Change Power Pact To Use Solar Panels, Not Thermal” by Cassandra Sweet for The Wall Street Journal reports on NRG Energy, Inc. (NYSE:NRG) plans to substitute 66 MW of photovoltaic (PV) solar for the prior 92 MW solar thermal contract with PG&E Corporation (NYSE:PCG) based on eSolar technology. The development is striking since NRG Energy is an investor in eSolar and correlates with my recent Sierra SunTower observations. In the interest of transparency, I call on eSolar to apply basic IT (Information Technology) to dashboard real time operational status and electricity generation from the Sierra SunTower Project on their website. The Sierra SunTower Project points out why O&M (Operations and Maintenance), system uptime, and availability are crucial to reliable CSP generation. For those looking to visit the site, the exact street address of the eSolar Sierra SunTower Project is 450 W. Ave. G, Lancaster CA 93534. The address has proven difficult to find via Internet search and is not visible on the Google maps satellite view. eSolar has not yet responded to my observations or questions about the operational status of the Sierra SunTower Project although the request was acknowledged. Of course, I find it ironic I am using Picasa to share my photos of eSolar’s CSP project. thks for your update info, i have wanted to visit the sites as well. have you found out why they’re not operating? was due to interconnection or eSolar’s system design issue or something else? eSolar has decided to have a dialog. Here are some of their points of clarification. eSolar said: “During your visit last week, the operations team scheduled a “planned outage” in order to complete the installation of an onsite fire system. As construction work was done close to the power block, it was unsafe to run the turbine. Additionally, the area experienced high winds on May 25, forcing the mirror fields to go into a “lockdown wind stow” position, an automated safety feature. A follow up post is a certainty. Yes, but the REAL question is, why did eSolar lose the battle with traditional solar panels then? Sure seems like this plant must not be competitive with the grid without subsidy. We’ll never know the internals of the capex spent and the ROI until eSolar is already successful (at that point it wont’ matter anymore), so all we have to go on is whether or not the company expands. It appears as tho they are not expanding, which means the technology must not be cost effective. This could explain the Obama bumper sticker on Gelbaum’s car– solar is typically a government “bailout” of rich green environmentalists, not an actual technology that’s efficient. And “rich green environmentalists” or “bailout” is a term yielded by panicky rich industrialists trying to manipulate middle class opinion in favor of maintaining (their) status quo. I live in the AV and drive by this plant on a regular basis. I would say it does not work. The central towers are dark most of the time, and when they are lit it appears that people are manually adjusting the mirrors. When the say the plant was shut down for wind in the article … that explains it. It is windy almost every day here. This large scale Green energy stuff seams silly. It it a basic space versus megawatts equation for me. The plant near Blythe, CA is roughly the size of the City of Berkeley. Lastly, the amount of water needed to wash these mirrors off is disturbing. At least the plants in the AV are to be on private land. California is slated to loose lots of public lands to this inefficient means of energy production. It is really incredible that having this plants to help the environment they are not working, nothing it can done to fix this?? Any update on the request you made to eSolar? I live about two miles from the Sierra Sun Towers, and they have fascinated me since I first arrived in Lancaster around Christmas 2011. I have looked and looked on line for info…diagrams and pictures and layman explanations of how they work, and why the two different types, etc… Short of going to the front gate and asking for a tour, is there any way I can obtain this information? January 2014, still shutdown and operated by a skeleton crew. There’s more work going on in the adjacent scrap yard and trailer park meth lab.